CHICAGO, IL--(Marketwired - May 25, 2016) - Travelers looking to book pet-friendly accommodations this summer will want to add an additional inquiry to their planning checklists: Are the hotel beds protected with a PerfectCLEAN® PCiPAD? So says George Clarke, CEO of UMF Corporation, developer of the new mattress protector that he says is having a profound positive effect on Guest Room Hygiene and improved Guest Experience Index (GEI) scores. The PCiPAD simultaneously protects the well-being of hotel guests, the hotel's investment in its mattress inventory -- and those four-legged members of the family who are increasingly joining the journey. With the summer travel season starting Memorial Day weekend, AAA is predicting that more than a third of Americans will take a family vacation this year and almost 70 percent of those holidays will be road trips. "For many, these trips are no fun without the four-legged members of the family," Clarke said. "And the friendlier pet-friendly hotels and resorts are turning to our new mattress protector to safeguard the most prominent investment in the room: the hotel bed. "Because of the PCiPAD, those common pet accidents that can pose a hygiene dilemma, ruin a mattress and even result in extra room charges are easily washed away and the mattress protector placed back on the bed without difficulty," he said. "Beyond accommodating Fido, the PCiPAD offers to guests the comforting knowledge of staying in a room that includes a clean, fresh and hygienic mattress -- free from odors and cross-contamination issues," Clarke said. Referring to a recent J.D. Power study of hotel satisfaction, he noted, "We know that among all problems experienced by hotel guests, rooms that are not clean have the greatest impact on satisfaction." For the hotel, Clarke said the benefits are multiple and include the decreased costs associated with reduced mattress replacement and the reduction in out-of-service rooms. The PCiPAD comes to market after extensive development and in-service trials. 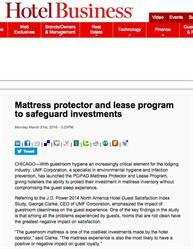 In a recent Hotel Business article, Clarke said UMF Corporation developed the mattress protector to meet extensive criteria. "Chief among these: The guest could not know the pad was on the bed, and it would have no impact on the sleep experience. It would provide complete protection from all types of spills and accidents, [and be] durable, lightweight and easy for the room attendant to remove and replace. We accepted the challenge and, many months later, after numerous prototypes and extensive testing, the PCiPAD was ready for market." The PCiPAD Mattress Protector is latex-free, has a comfort layer backed by a soaker layer supported by a barrier layer -- all for complete mattress protection. It absorbs, wicks and retains fluid unlike competitive products that repel and puddle. It's durable, lightweight and easy for room attendants to change. 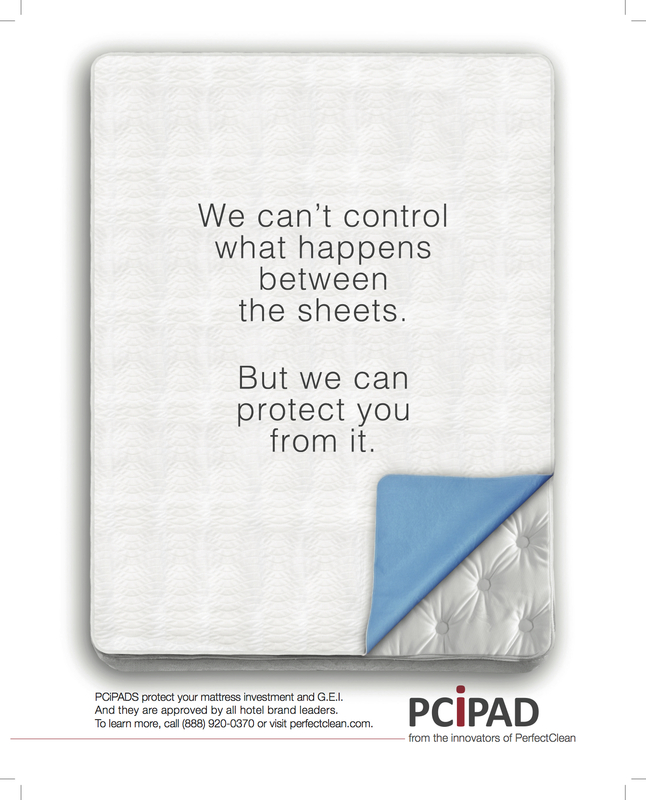 The PCiPAD comes in all standard sizes and provides complete corner-to-corner protection. At its website, UMF Corporation has provided a simplified calculator and application process for hoteliers interested in leasing its new mattress protector. In four easy steps, the online application process enables the hotelier to calculate the cost of leasing the PCiPAD based on the total number of mattresses to be covered, typically less than 5 cents per day per mattress. According to Clarke, the PCiPAD comes to market after extensive development and in-service trials. He said the lease program is the only one of its kind and makes the PCiPAD program available and easy to implement economically for every type of property. Minimizing cost and maximizing the ROI per mattress, Clarke said the PCiPAD has exceeded expectations and saved hundreds of thousands of dollars in lost mattresses and, ultimately, kept "more heads in beds." UMF Corporation manufactures the PerfectCLEAN system of hygiene products featured in Starwood's ABC's of Housekeeping. Innovators and specialists in environmental hygiene, UMF Corporation delivers advanced, patented antimicrobial technology with industry-leading PerfectCLEAN® products, education, training and support. The company, headquartered in the Chicago area, is the only U.S. company that designs, engineers and manufactures high-performance fibers and accessories to help its customers meet tough new challenges in public health and safety. For more information, visit www.perfectclean.com. Follow UMF Corporation on Facebook, Twitter, LinkedIn and Pinterest. Don't forget to ask: Are the hotel beds protected with a PerfectCLEAN(R) PCiPAD? 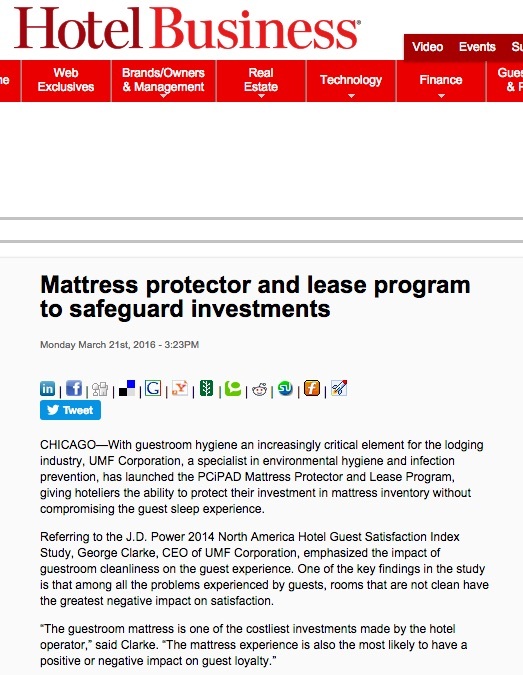 George Clarke, CEO of UMF Corporation, developer of the PefectCLEAN(R) PCiPAD says the mattress protector is having a profound positive effect on Guest Room Hygiene and improved Guest Experience Index (GEI) scores. In a recent Hotel Business article, CEO George Clarke said UMF Corporation developed the PCiPAD to meet extensive criteria. "Chief among these: The guest could not know the pad was on the bed, and it would have no impact on the sleep experience. It would provide complete protection from all types of spills and accidents, [and be] durable, lightweight and easy for the room attendant to remove and replace. We accepted the challenge and, many months later, after numerous prototypes and extensive testing, the PCiPAD was ready for market."